PLEASE LIST COLORS IN NOTES TO SELLER ON CHECKOUT! YOU MUST CHECK AVAILABILITY BELOW! IF YOU CHOOSE AN OUT OF STOCK COLOR - SHOWN BELOW - WE WILL SUBSTITUTE ANOTHER COLOR IN ITS PLACE. IF NO COLORS ARE CHOSEN WHEN THE ORDER IS PLACED WE WILL SEND AN ASSORTMENT OF AVAILABLE COLORS. I suggest copy and pasting this list in the notes to seller on checkout and deleting the colors you do not wish to order. 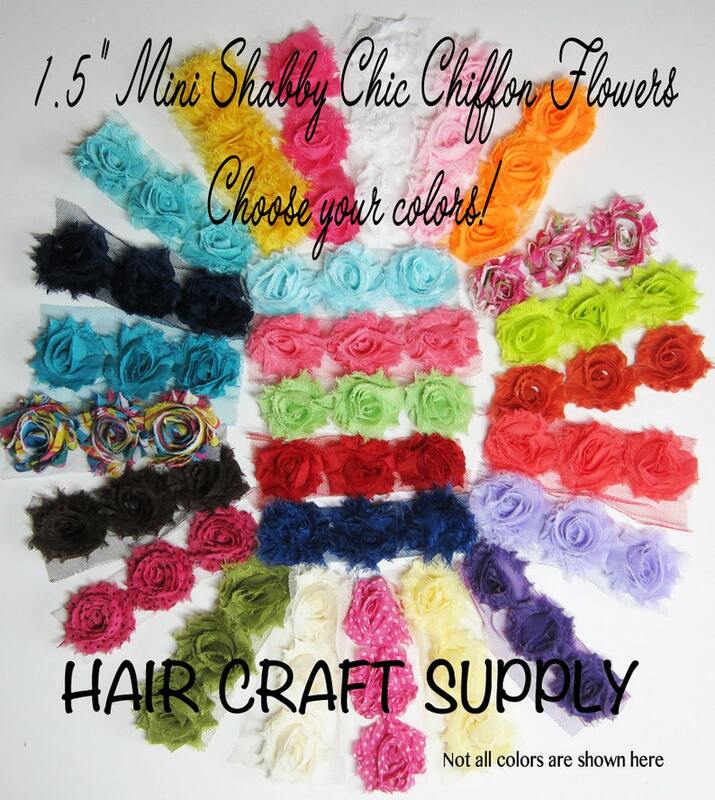 This listing is for 12 Shabby Chic Rosettes - ANY COLOR, ANY QUANTITY OF EACH - your choice. If you require a large amount of any one color, please message us for availability. Each rosette is made of chiffon and measures approx 1.5" (3 cm) These chiffon flowers have a shabby vintage look. Flat at back - prefect for crafting! Add a felt circle to the back for added support. Flowers are on mesh and are untrimmed. PLEASE NOTE: These are from many different suppliers so the fabrics used may not be identical and some may be more 'frayed' than others. Colors marked with X are currently out of stock and may not be restocked . Lots of possibilities with these. Add one to a skinny elastic for a delicate baby headband or add three to soft stretch elastic (FOE - Fold Over Elastic) and add embellishments to make a pretty hair accessory. Glue a couple to an alligator clip for the cutest clippies! These are also great for crafts. Headband photo is to show how pretty three of these look on a headband. Love them great quality! highly recommended! I ordered white and ecru and they are beautiful! Can’t wait to use them as embellishments in my junk journal. They arrived quickly and well packaged. I would buy from this shop again!